Looking for easy Valentine’s Day crafts that you can make with just a few simple supplies from around your home? We’ll have a couple for you this month, starting with this beautiful Valentine’s Day decor banner! This post contains affiliate links. It seems as though you can’t get through Valentine’s Day without seeing lots and lots of hearts. But if you are tired of the same old red and pink hearts, this “music of my heart” Valentine’s Day decor banner is the perfect solution. Crafted from elegant sheet music, this banner is the perfect way to get in the Valentine’s Day spirit without all of the red and pink. Take a look below at how easy it is to craft your own. It is easier than you may think, and quite inexpensive. Take a look! If you are unsure where to buy sheet music, check out your local thrift or antique shops. You can typically find old music books, manuals, and sheets for less than $1. 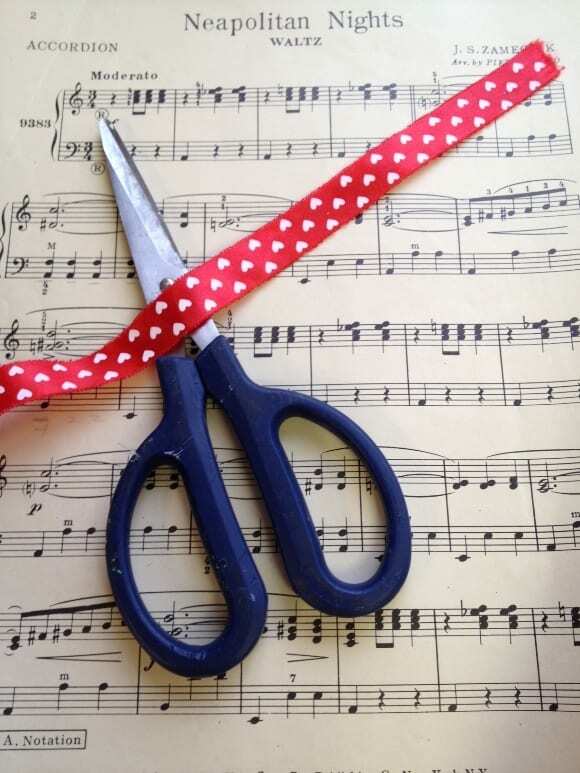 If you’re planning on making a very large banner or several of these fun Valentine’s Day crafts, you can grab a sheet music book on Amazon for under $5. You don’t need a great deal, in fact we were able to cut four decent sized hearts out of just one piece of music. As for the ribbon, we were able to find this simple yet festive red ribbon at our local dollar store, making this Valentine’s Day decor craft a frugal one. 1. Begin by gently folding your sheet music in half. This will make your hearts more even when you begin cutting them out. 2. Using a stencil or just free handing, begin cutting out hearts from the sheet music. Repeat the process until you have the number of hearts you wish. We opted for a shorter banner using larger hearts, so four was the perfect number for us. Snip out more or less depending on your needs. 3. Lay your ribbon flat on a counter top or floor. Apply a few dabs of glue to the top portions of the hearts. Directly on the curves seems to work well. Press the hearts to the ribbon, holding it firmly in place until it adheres. 4. Repeat the process spacing your hearts out every two inches or so until the banner is the length you wish. 5. You can add more embellishing if you wish, such as glitter on the hearts or ribbon in between each heart. We chose to leave ours simple but get creative if you wish! Your banner is now ready for hanging. It will look so sweet hanging from a mantel, book shelf, entryway, or even the front of an office desk. Just use a little tape and hang the banner wherever you wish. It is sure to add some romantic Valentine’s Day charm to your home that is simple yet elegant. 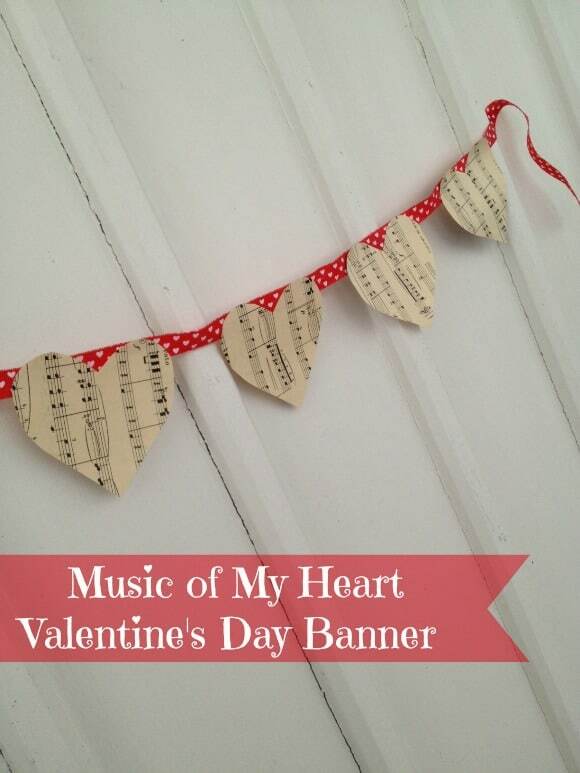 Gather the supplies you need and give this music of my heart Valentine’s Day decor banner a try. It is a great way to get into the holiday spirit in a way that is fun, frugal, and more unique than the traditional red and pink explosions you typically see. Looking for more great Valentine’s Day crafts? Check out this easy tutorial to make your own Valentine’s Day Wreath. Prefer Valentine’s Day crafts for kids? Check out our super cute DIY Playing Card Valentine’s Day banner over at our sister site, My Kids Guide. Do you decorate for Valentine’s Day? What is your favorite craft? Great idea! My mother in law is a former piano teacher and would love such a garland. This made me smile. Maybe because I am married to a musician! I’m eager to try it. Unfortunately no local thrift or antique shops nearby. However I am going through troubles with your RSS. I don’t know why I cannot join it. I love this, what a fun way to reuse sheet music! Just stopping by to pin this, and to let you know I featured it on my blog today! What a great twist to an easy craft! Thanks for sharing via Family Fun Friday. These musical hearts are beauties! I actually was doing some sorting of papers (seems they are everywhere in my house) and came across some sheet music no one is playing anymore. I may just have to try this idea. Thanks for sharing. Visiting via ‘FamilyFunFridayWeek’ from over at http://www.ritewhileucan.com where I gush over all things paper. You might enjoy. This is such a cute idea! Thanks for linking it up to our All Things Thursday Blog Hop last week! Hope to see you again this week with more awesomeness! Now why didn’t I get some of that ribbon the other night when we were in $tree? Doggone it anyway. The red ribbon and black and white sheet music go so well together. Thank you for linking to the Weekend re-Treat Link Party. This is great! So easy as well! Just stopping by from Create It Thursday to say hi. This is such a cute little banner. I already pinned this post. I love this banner! So easy and sweet! I decorate a little for valentines day…a few valentine banners and thats it…lol, its all wasted on my boys, they only care about the candy! Love this idea. My kids could do this. I have some old sheet music that has been waiting for the perfect craft idea. I love your musical Valentine’s craft! It’s very creative, and looks very easy to do with the kids. We don’t do a lot of decorating, but we do make some to create the mood. This banner is so sweet and you could certainly choose other background to suit your needs. Thanks for the great idea! Learn how Walmart’s Online Grocery Service Will Change the Way You Shop! Special Education: What’s So Special About It?